This is a unique mask with anti-inflammatory, healing, soothing, softening, moisturizing and nourishing properties. Paraben- and fragrance-free, without artificial colorants, hypoallergenic, dermatologically and ophthalmologically tested. The star ingredient - SPA™ Thermal water*: natural mineral spring water from protected environment regulates various skin’s physiological mechanisms, slows down the ageing of connective tissues and restores them, as well as forms a protective film on skin’s surface. Immediate softening, decongesting and soothing effect (alleviation of redness) due to brown algae extract. Immediate softening, decongesting and soothing effect (alleviation of redness). 85% satisfaction -satisfaction index on 20 subjects after testing the product twice daily for a period of 1 month. Blue ageratum leaf algae extract To soothe and limit the emission of inflammatory messengers at a cellular level. Red algae extract For decongestion and to limit the appearance of the visible signs of discomfort. Spa™ Thermal Water To balance the skin’s tolerance threshold and help skin lastingly reduce its sensitivity. Aqua (water), Glycerin, Myristly myristate, Glycol palmitate, Cetearyl alcohol, Diethylhexylcyclohexane, Butyrospermum parkii (Shea) butter, PEG-25 stearate, Butylene glycol, Disodium EDTA, Sodium dehydroacetate, Citric acid, Biosaccharide gum-1, Palmaria palmate extract, Chlorhexidine digluconate, Glyceryl caprylate, Sodium levulinate, Sodium anisate, Ageratum conyzoides leaf extract, Tocopherol. Apply on a thoroughly cleansed face and neck skin in even layer. Leave for 10 minutes. Massage the remains in case of the dry skin or wipe off in case of the normal/combination skin. Use 1-2 times per week or upon necessity. I love this mask and use it at least twice a week. It is very soothing and melts on the skin making it feel relaxed and moisturised. I leave it on all night to ensure maximum benefits. 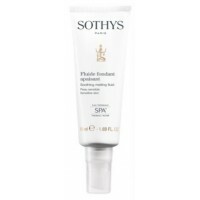 I love this product - its great for my hypersensitive skintype, and it feels good!